Smoke from the Deep Creek fire can be seen behind Sleeping Giant in Routt County. 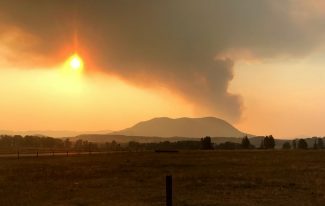 With an active wildfire season in Routt County, officials are encouraging residents to sign up for emergency alerts at routtcountyalerts.com. Fire managers continue to be concerned about winds associated with passing thunderstorms that sometimes produce little moisture. Local meteorologist Mike Weissbluth, who runs snowalarm.com, said the chances for showers will increase Wednesday afternoon as a storm approaches the northwest. Weissbluth was calling for a better chance of cooler weather and wetting rains Thursday and early Friday. In northern Routt County, there are 38 people working at the Big Red Fire burning in the Routt National Forest. It has burned 2,931 acres and was burning into the Zirkel Wilderness. In neighboring Moffat County 10 miles south of Maybell, the Pine Tree Fire has burned 4,732 acres. There are 115 people working that fire.